The Matheson will be a social gathering place for everyone in Healdsburg, locals and visitors alike, to share the beauty that we call home. The concept… a place us locals, and our visiting friends and family, can all break bread together! A place for locals, and a place for visitors! A place for local artisans, craft makers and people to express their passion for food, wine, the arts and being part of the Healdsburg community. There will be a focus on the art of the craft, the doers and makers of Healdsburg and Sonoma County. Everything will be authentic, every item will have a story and a spotlight on the person who makes it -- from the farmer, to the cook, to the forager, to the woodworker -- this will be the place for the passionate artisans to share their craft. The Matheson, which is on the ground floor, will seat a total of 98; The main dining room seats 60 people, with a bar area of 13, private back room of 12 and seating around the kitchen that accommodates an additional 13. The main restaurant dining room itself is only slightly larger than Valette. There will be a mezzanine level, with seating for 24 people that will only be used for overflow dining during peak summer months and not use every day. 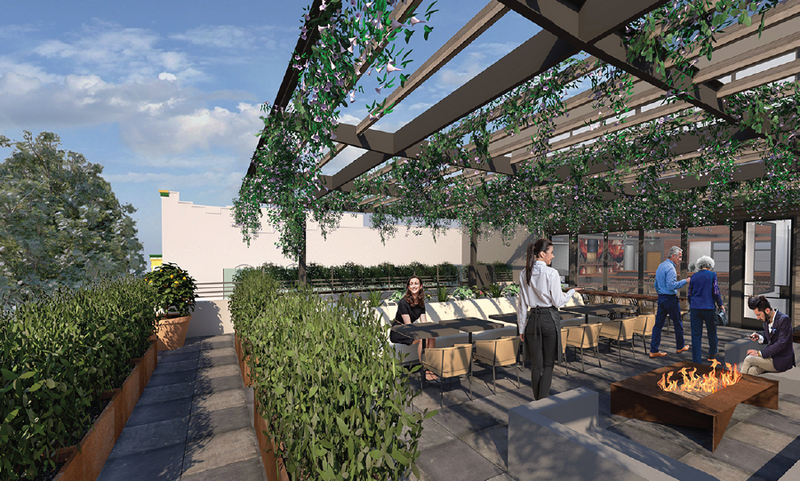 Roof 106, the al fresco, rooftop-dining experience above The Matheson, will be based off quick bites and European inspired cuisine cooked in a locally produced Mugnaini Wood Fired Oven. Seating will be indoor and outdoor for a combined total of 109 seats, 52 of which will be outdoors and only available as weather permits. The overall project will contain a total of 231 seats that effectively operate as two separate restaurants in a variety of seating arrangements. The diversity of seating encourages social interaction of longtime friends, new friends, families, seniors, tourists and all who live and engage in our community. The Matheson will be open 7 days a week for lunch and dinner. Operational hours will be between 11:00am to 10:00pm Monday through Thursday and 10:00am to 11:00pm on Friday, Saturday and Sunday. It is estimated that the restaurant would attract approximately 150-250 customers per day, on average, depending on the season. The 43 stall parking lot facing Healdsburg Avenue, directly behind the restaurant is the only parking lot on the plaza that is private. The Parking lot belongs to the 106 Matheson building and will be used for the restaurant.